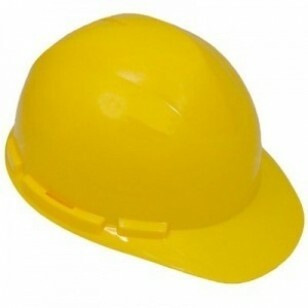 The construction safety hard hat is one of the most recognized pieces of safety equipment. The hard hat's shell is constructed from High Density Polyethylene. Rain trough on sides and back of helmet channel moisture away. Soft brow pad is replaceable and washable. Low profile design. Universal accessory slots fit hard hat mounted ear muffs and chin straps. Snap Lock suspension features tuck away adjustments for all day, hassle free wear. Meets ANSI Z89.1 standards, Type 1 - Class C, G, and E.